The past few months have been peppered with big, exciting life events - both mine and those of some of the people close to me, and it's so easy to fall into that trap of thinking that the traditional life goals imposed on us by antiquated societal norms are the only way to go. Weddings, baby showers, christenings; they're all perfectly good ways to mark milestones in your life should you so choose, but I don't think they're necessarily any guarantee of emotional contentment. I've known plenty of people who got married and ended up leaving their marriage because it turned out that a marriage certificate doesn't act as a relationship bandage. I also know people who have cohabited, some of whom have raised children and been a perfectly happy family unit without feeling the need to arrange a wedding. I'm aware that there are perfectly valid arguments both for and against the concept of marriage, and that what's right for one person isn't necessarily right for another. Personally, I have never felt any desire to get married. Even from a really young pre-school age (before the Let Toys Be Toys generation, where visiting your aged relatives would result in being showered with faux vacuum cleaners, ironing boards and doll prams to entertain your visits). One of the options in the dressing up box was an old lace curtain, which was used by my sister as a bridal veil. I'd always opt for the floaty vintage nightgown instead and be the bridesmaid, or the vicar, or the horse to pull the carriage. Ageing relatives used to try and reassure me: "You'll change your mind one day." I guess they were wrong. As someone who shuns religion, a wedding would feel hypocritical, if nothing else. I would not be able to bring myself to spend the kind of money people brag about their weddings costing, on a day full of stress and anxiety. I can't think of anything much worse than being the centre of attention on a regular day, and I figure those feelings would be heightened tenfold. Over the years, I've lost count of the number of times I've been told that when I meet the right person, I'll change my mind. I don't know how one is supposed to know right from wrong people, but as someone who is part of a committed-enough relationship to have joint life insurance policies and share a mortgage, I don't quite see how standing up and repeating vows would change the way we feel. Or act as proof of how committed we may be. I don't feel the need to validate my relationship by getting married, but I've lost count of the number of people who, since picking up the keys to our new home, have inferred that we're doing things in The Wrong Order. Having said that, I know that some people consider that the first part of showing their commitment to someone else is to marry them. Some people I've asked told me that they couldn't consider entering into something like buying a house without first having made a solid commitment to their partner. For us, that wasn't really a consideration, but I appreciate that priorities differ from one relationship to the next. I have to admit, I'm becoming pretty au fait with having to rebuff hints from well-meaning family members. I mean, if it's not questions to do with when we are planning children (a topic for another day, but just note that it is NEVER your place to comment on someone else's decision on whether to procreate or not..), someone will say something like "so, when will we be getting the save the dates?" or "how can you consider yourselves a family unit if you don't share the same name?!". Christmas dinners seem to have become bingo games to me, these days. I know that some people consider their family unit to be more complete if they're married and they share the same family name. I don't really have any particular thoughts on surnames. Perhaps that would be something I'd feel differently about if we did have children. If I were ever interested in getting married, keeping my surname wouldn't be something which I'd consider a deal-breaker. I'm not particularly attached to that and wouldn't be interested in a shared name or a hyphen. For a society which is so progressive in so many other ways, it just feels a little backward to me that we rest *so* much on this antiquated tradition. Why is marriage still seen as the correct choice, when according to recent stats from the ONS, around 42% of marriages end in divorce. Certainly, of the small number of weddings I've attended, more than half of those had broken down within the first few years. Do people enter into it more quickly than they did in the past? Or is vowing to stay together forever not considered as important as it once was? I know that previous generations didn't seem to consider divorce as readily as our society does, perhaps because they didn't see another option. I asked for other people's opinions on marriage too and have had a mixed bag of thoughts. For some, the religious aspect of marriage is off-putting, but the recent Civil Partnerships Bill could, if it progresses through the House of Lords and becomes part of the legislation, be an alternative for those wishing for more legal recognition of their relationship. Perhaps that would be a possibility worth considering. Where people have married in the past because it made more financial sense than drawing up legal paperwork to give powers of attorney, this could provide a solution. For some, the things which scare me the most (big parties surrounded by family and friends and having to be the centre of it all) are the main selling points. It's funny how we can all be so different. I'd just like to underline that this is an opinion piece and that I am in no way judging anyone for their views or beliefs, however they may differ from my own. I'm going to leave this here as I realise this is becoming super long. so have yourself a cookie if you made it to the end and please feel free to share your thoughts with me. (Feel free to do that by DM or email or to keep your comment anon if you'd prefer). 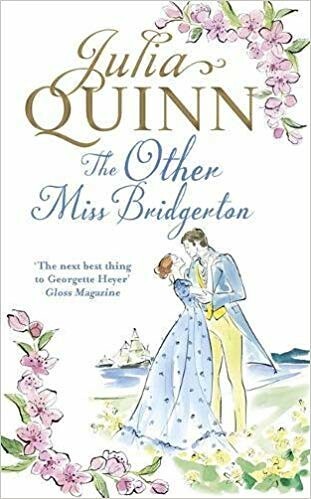 Described by some as a modern-day Georgette Heyer, so far I haven't found a Julia Quinn book I didn't enjoy. This one is no exception. Known to society as a rascal and reckless privateer, Captain Andrew James Rokesby actually transports essential goods and documents for the British government. Setting sail on a time-sensitive voyage to Portugal, he's stunned to find a woman waiting for him in his cabin. Surely, his imagination is getting the better of him. But no, she is very real-and his duty to the Crown means he's stuck with her. 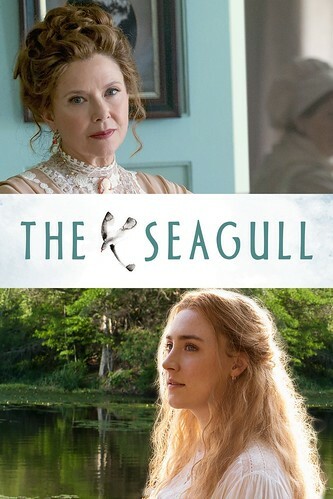 When Andrew learns that she is a Bridgerton, he knows he will likely have to wed her to avert a scandal-though Poppy has no idea that he is the son of an earl and neighbor to her aristocratic cousins in Kent. On the high seas, their war of words soon gives way to an intoxicating passion. But when Andrew's secret is revealed, will his declaration of love be enough to capture her heart...? Definitely a book to curl up with under a blanket on the sofa if you fancy an enjoyable mix of historical romance and comedy. Plus, pirates! This is out on 20th November if you fancy a feel-good read, perhaps to snuggle up with over the festive period. This week, although I've been short on spare time at home, I've made a little more progress with unpacking some of the remaining boxes and we've found a dining table and chairs, which we'll be off to collect soon. I must admit, I've been feeling a little blue about it all lately, as progress is slower than I'd expected, and I feel as though I can't get visit friends at weekends because I *should* be staying home to work on the house, but it's not ready enough to invite people over. So I feel sad because I'm missing friends, I guess. Hopefully, the dining room will at least be usable once we get some furniture in there, which should mean that we'll be able to entertain friends for dinner. And that got me thinking about other things we might need to finish off that room. 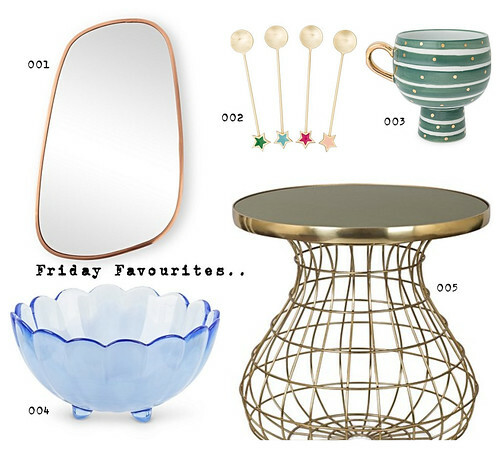 This week's finds have all come from Oliver Bonas, where I always go to drool over the pretty homewares. I''ve also got my eye on some of their furniture, which I know I've mentioned previously. 001: I love a mirror to give a room more light and since our dining room is at the back of the house, it doesn't get a lot of natural light. This shape makes me happy. 002: I also love colourful and quirky tableware so these spoons would be a welcome addition to my cutlery drawer. 003: I'm becoming a bit of a mug ninja lately, which basically means that I buy new mugs rather often and try to sneak them into the mug cupboard in the kitchen and into everyday use without being noticed. Most of the time it works. I love this mug, although kind of wonder if it might fall over, due to the shape of the base..? 004: A pretty glass bowl would make a lovely centrepiece, filled with fruit, or pine cones, perhaps? 005: Absolutely love this little side table. The shape, the mesh and the contrast between that and the top, which is a lovely shade of olive green, which would go with the rest of the decor. How do you make home decor decisions? It's so tricky! Let's got to the movies, let's go see the stars.. I must admit, although my heart will always belong to the summer months, I do enjoy this time of year. When the seasons are changing and the nights are beginning to draw in. It makes me feel all happy to be getting the coats out of storage and layering up in scarves and hats. 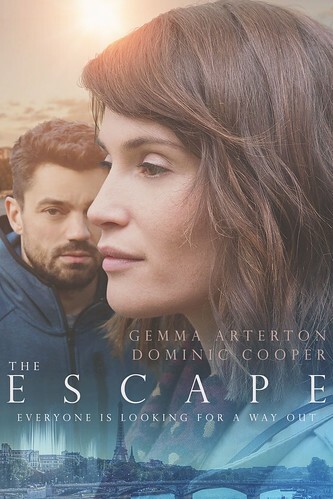 When I booked it, all I knew about The Escape was that it was about a lady who was sad and ran away to Paris. I mean, so far so relatable in my opinion. Tara, the central character, is surrounded by all of the things humans have been programmed to think are good in life: a good husband, two doting kids, a nice house and the chance to be a stay-at-home-mum. But she is feeling lost and seems to be drowning in confusion and discontent. It was almost painful to watch her struggle with this, and the sense of relief when she finally found the strength to make that escape. Sometimes I think that people worry too much about whether they can like or relate to a character in a movie. I found probably everyone in this film a fairly frustrating bundle of hypocrites, but that to me made the struggle of emotions all the more real. People's lives are never as perfect as one thinks and to see a very realistic representation of day-to-day unhappiness in a marriage which isn't headline-worthy or abusive was a fresh new take on this and something I was pleased to see portrayed. Another wonderfully raw emotional movie. Based on Chekov's play of the same name, at least I knew what to expect from this. So much sadness. So much unrequited love. I think that everyone in this movie is in love with someone who doesn't love them. Apart from Sorin, who tells us has spent his life sad because he never managed to find love or become a writer. Centred on a kind of messy love triangle - or should that be love square?! - between "famous" writer Boris, his actress lady-friend Irina and the startstuck Nina (who also happens also to be the girlfriend of Irina's son, Constantin). Again, the movie is full of sadness but in an altogether more watchable and entertaining way. There is also humour here - the household's reactions to the hateful Irina's narcissism, for one thing. I felt a little more empathy watching this movie, although not a huge amount if I'm honest. All of the characters are using one another and I guess that should make me like them less, but what is that if not an accurate representation of life..? Hmm, turns out I'm fairly drawn to sad movies. But I'll maintain that curling up in the warm for an evening at the cinema (in my favourite seat - I have a regular seat!) is one of my favourite autumnal pasttimes. How can it be that time again? I'm sure I say this every year. 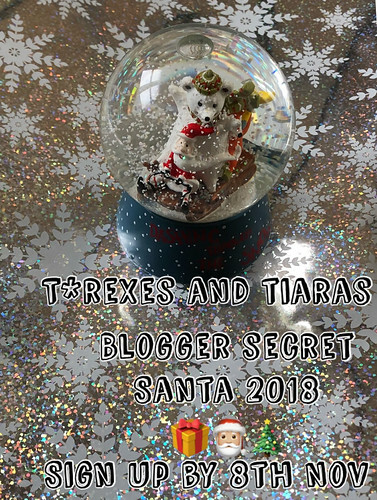 I'm running my annual #bloggersecretsanta parcel swap again this year. It's so weird because I'm such Scrooge and yet I really look forward to this little spreadsheeting and snail mailing task. I'll send out your partner's details and you'll have a few weeks to take a look at their blogs / social media and put together a parcel. The spend limit for that is £10, not including postage. Then, post your parcel by 14th December, and let me know when you've posted and when you've received a parcel. Couldn't be simpler! For anyone wondering about GDPR: Please note that I only use your address information to tell your sender where to post to. Unfortunately this can't really be avoided if your sender is to be a secret. I delete all information after the swap has happened and will only use your email address to send you information about your recipient, and to keep you updated with any delays or information. In signing up to this swap, you are giving your consent to my using of your personal data for the execution of this swap. <-- This does mean that if you have signed up in the past, I'm afraid you'll need to send me your details again, as I no longer hold any of them. Any questions, don't hesitate to contact me! Another Tuesday - they're rolling around so quickly, lately. I'm feeling a little snowed under at the moment and like a bit of a bad friend as I've been struggling to keep up with everyone. Ugh. Anyhow, I've been trying hard to make time for reading, even if it's just by leaving my phone outside of my bedroom or downstairs, to stop me messing on apps before bed (even though there seems to be a bit of a Plants vs. Zombies tournament going on in my house at the moment), and reading instead. Even that half hour or so has made such a difference and I'm working my way through so many books on my Kindle. 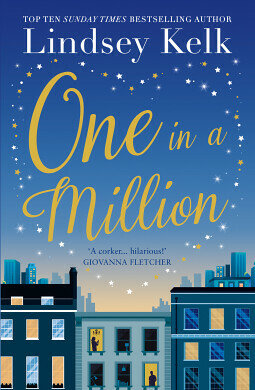 This week, I've read One in a Million. Annie Higgins has a start-up social media company and is determined to make it a success. She makes a bet with another company in her building that she can't make the next person to walk through the door "insta-famous" within the next thirty days. So far, so She's All That, no? Naturally, the victim of the bet is the most uncool, social-media shunning academic, who also happens to work in their building. Annie is not deterred and peppering every conversation with references to social media stars and current trends, she sets aside time in her working week to focus on winning this bet. The book is a funny, light-hearted look at modern day technologies versus traditional values and how they could work should they come together. There are so many references to Zoella, iPads and Buzzfeed that I think this book might stay in the twenty-teens, but it was an enjoyable read nonetheless. Well, that little heatwave was over quickly, wasn't it? We now seem to be in the stormy throes of Storm Callum, I think this one's called. Which has gotten me thinking about layering up for Autumn as my usual dress / cardigan combination just doesn't seem to be cutting it. 001: I'd actually found this dress entirely by chance. The other day I was in Sainsbury's and noticed a rather lovely looking green pinafore dress, with some floral embroidery at the top. I'd planned to share that on this week's wishlist but it doesn't seem to be on the website, so in looking for something similar, I got all heart-eyes over this. I love velvet. And everything bottle green for the colder weather. And that collar. Winner! 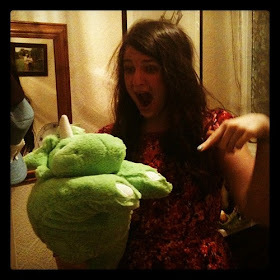 002: This Joanie jumper couldn't be any more perfect for me if it tried, really. Pink *and* dinosaurs?! What could be better? 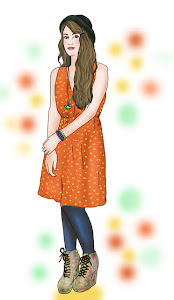 I'd layer it up with a pinafore or over a dress and some tights as the weather got colder. 003: These Clarks shoes seem to be the same shape and style as those classic Orla Kiely Bibis, which I have in a couple of colours. A very comfortable day to day shoe if you can get used to almost-flats. I love the metallic silver leather and the fact that they'd go nicely with colourful or textured tights. 004: A much more purse-friendly version of the Kate Spade dinosaur keyring from a couple of seasons ago. This little guy comes in metallic mint green and has the same articulated hand and leg detail. Super cute addition to any bags and I think I need one to replace the dino bag charm which I lost en route to Paris - that'll teach me not to remove things when I check my luggage in! 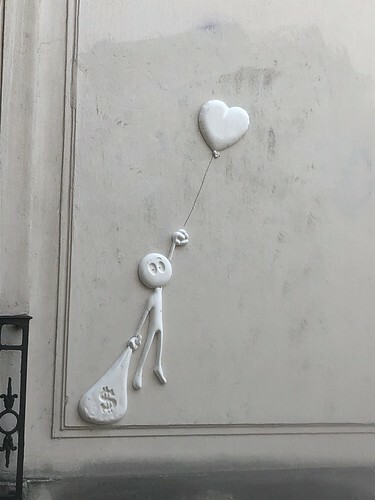 About a month ago, I spent a few days in Paris. I'd definitely say it's up there with my favourite places to visit, and no matter how many times I do so, there's always something new to do or see. Whilst we were there this time predominantly for touristing, and that did mean that I did a few things which I'd done before, visited things I'd already seen and showed off my favourite sights, I was also pleased to be able to experience some new places myself. 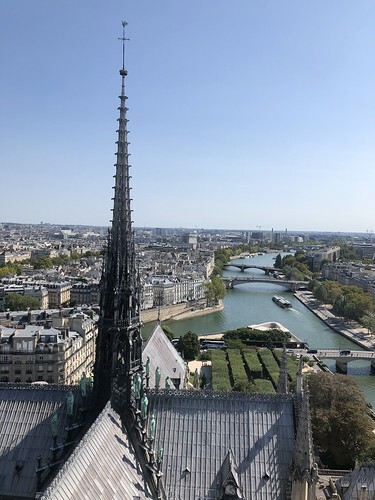 Near the top of our to-do list was to visit Notre Dame, as we had both seen it from the outside but never ventured through the doors. I did a little research before we visited in the hope that we could book advance tickets, since it always seems so busy out front, but to no avail. The cathedral itself is free to enter and open to the public almost all day (except for Sundays when they have church services and visitor numbers can be limited). You queue for security and bag checks, but after that are free to roam, with the option to pay to enter the treasury room (we didn't). 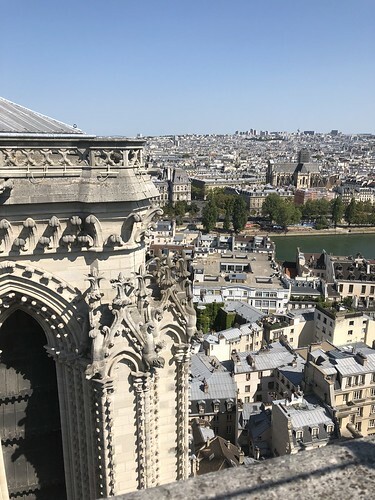 Since I'm not a religious person, I appreciated the building for it's architecture, but have to admit I was most interested in scaling the towers. Getting tickets for these is pretty straightforward, although they are only bookable on the day of visit. You have to either download an app, which holds your place in the queue and alerts you when you're 20mins away from your time-slot (these seem to be every ten minutes or so), or you fill in your details on one of the computer screens by the queue and choose a time slot. Again, this can text you to confirm you're next up, so you could go off and have a wander or find some breakfast (which is what we did whilst we waited). You can find more information about the tickets and process here. 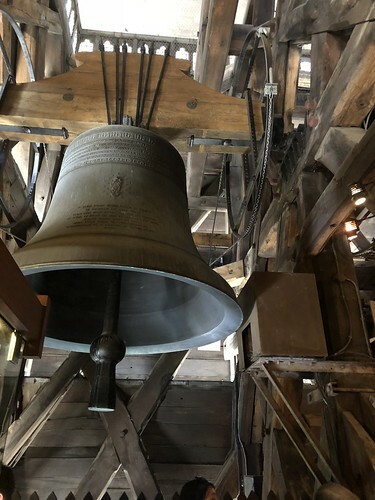 Upon arriving at our time slot and making our way through security, we are led up into one of the towers and the first flight of stairs, where we wait in the ticket office / gift shop for the previous group to descend. This gives you time to buy tickets (and browse the shelves of tat should you so desire - I guess this is quite successful as they have a captive audience). I think we were there for about seven minutes in total. And then, more stairs. When you come out onto the roof, the view is quite lovely. 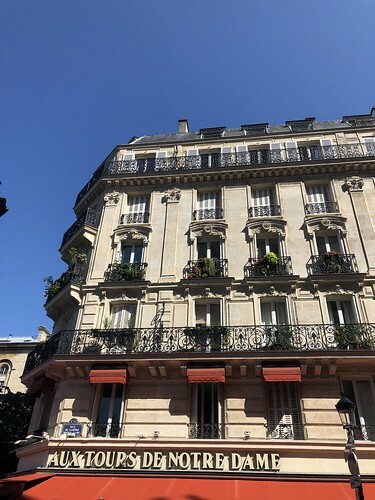 Yes, I know, another Paris-from-the-rooftops opportunity, and it probably seems as though that's all I ever seem to do in Paris. See things from above. But, it was really quite amazing to be able to see the towers and their amazing detail up close. 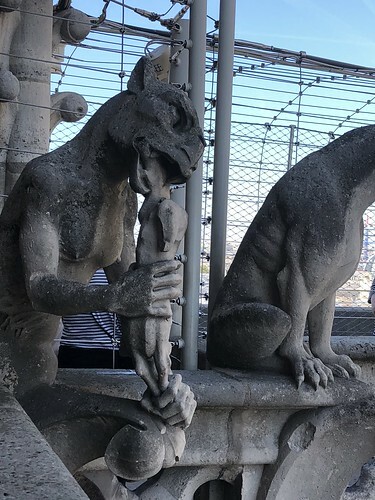 Of course, the gargoyles were my favourite thing*. I have to admit that I didn't know they were all different - I thought they'd all be the same figure. But their expressions and all of the different animals and characters were amazing - I took so many photos. 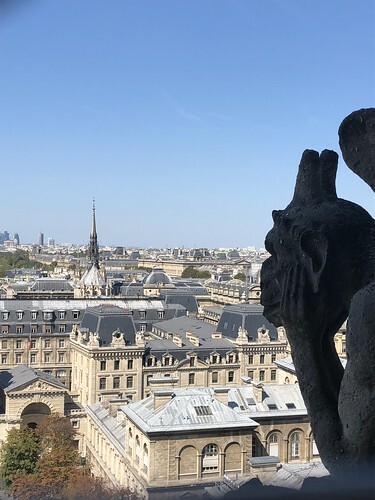 *In fact, I assumed they were all called gargoyles, but actually, I we learned that the statues which are there for purely ornamental purposes are in fact chimera (usually taking the form of mythical creatures or birds). 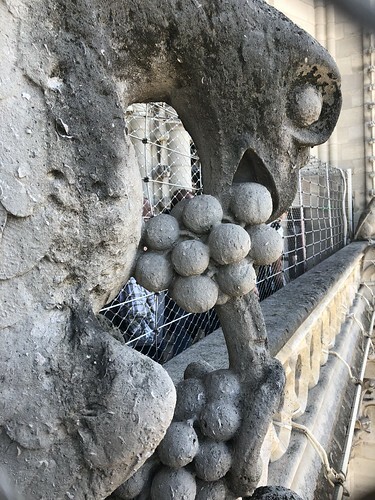 The term gargoyle is actually referring to the ornamental drainage spouts which are designed to protect the walls of the building from being damaged by rainwater. (See the sticky-out bits on the corners of the tower in the photo below). Honestly, whatever their proper name might be, I think they're incredible. And it's kind of inspired me to watch that Disney movie, The Hunchback of Notre Dame. 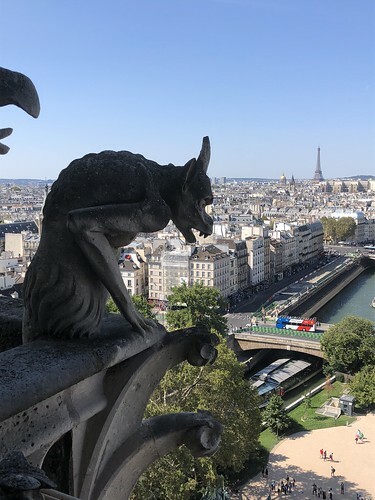 I'd definitely recommend the towers as a place to see in Paris if you should find yourself there with a spare hour or so. Once you've climbed to the top, you're pretty much free to take things at your own pace - everything is caged in and we found it best to hang back a little as there were a lot of eager selfie-taking tourists in our group. It's been a fair while since I sat down to start a book and didn't emerge until I'd finished it (well, except for getting more coffee) but I woke up pretty early Saturday morning and curled up in the armchair in the living room which gets the morning sun and read this week's book with no breaks.. I must admit that by about the end of the first chapter, I was hooked. Intrigued by Alicia, whose story is told through flashbacks to past events, through her diary entry and then later through her present day actions. 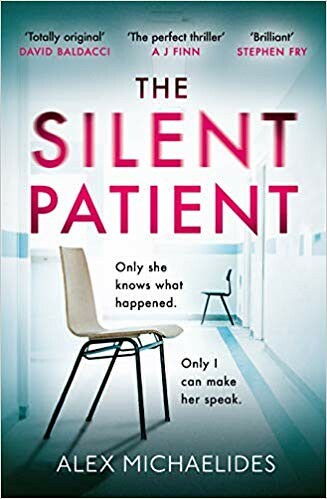 This is absolutely what I'd call a slow-burning psychological thriller and when all is finally revealed, you have one of those sharp-intake-of-breath moments. I really don't know how much more I can say without encroaching on the story itself, but the way the plot weaves together so seamlessly would probably make spiders jealous. This one is due to be released 7th February 2019, so definitely pop it on a wishlist. Long time, no see. I have so many posts in my drafts section, but never seem to find a spare moment to finish them off and publish them. The internet arrives next week, so maybe then. Anyway, let's talk about something I always manage to find time for - shopping suggestions for people. The other day I was asked for some suggestions for Autumn-friendly footwear, so I set off to Spartoo and have put together a few of my favourite options. Autumn colours to me are burgundys and mustards, with some dark shades of green thrown in for good measure. Anything reminiscent of the colours of the leaves changing, I suppose. 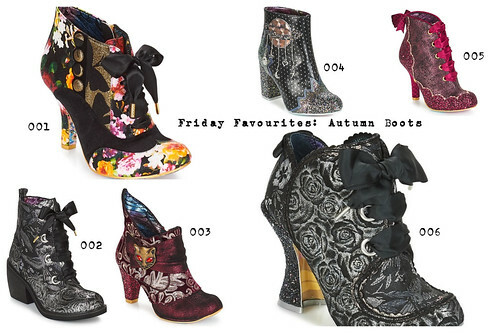 Here are a few of my favourites, all from Irregular Choice, of course. 001: I picked out these because of the mix of autumnal colours, paired with the bow and button detail to the side which gives them a little added interest. 002: I love that the metallic detail on these ankle boots - they make me think of Halloween, vampires and bats. 003: These Miaow boots are such a classic style, They get released most seasons in different colourways and I think this shade of burgundy is perfect for frosty mornings. 004: I know I've mentioned these before for myself, but the chunky heel make these planet boots both pretty and practical, in my opinion. 005: These jewel tones, combined with the ribbon laces just give that decadent autumn/wintery vibe and I can see them teamed with a fur-collared coat and some leather gloves as the colder weather creeps in. 006: The heel on these shoe boots is just amazing - the combination of glitter and the curved shape make it a winner. Do you have a favourite pair? Do you also turn to ankle boots in the colder weather?